We Be Reading: "Samuel Spade's jaw was long and bony, his chin a jutting v under the more flexible v of his mouth." 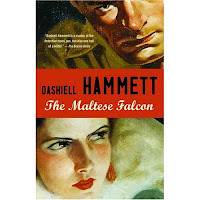 It's not very often that I read a book after seeing the movie version more than once but Dashiell Hammett's The Maltese Falcon is now one of the exceptions. I have seen the movie easily over a dozen times. It is a late night favorite in our house. It's dark and smart and complicated. I guess I never really thought about reading the book until I saw it on a "must read" list this year. I've read some Raymond Chandler books so I figured it was probably along the same vein. I was right but this book was definitely worth reading. 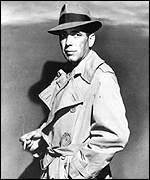 (Humphrey Bogart, dark and five foot eight) and the description in the book -- "He looked rather pleasantly like a blond satan" and "He was quite six feet tall". It was hard to picture this new Sam Spade and certainly to give him a voice other than Bogart's perfect nasal tenor. The mystery was followed quite closely in the movie except for a few pieces of background information that, for me, gave some much needed clarification on some things that had never quite clicked for me in the movie. The book also has some homosexual references in it that are not included in the movie (Peter Lorre is creepy, not gay). 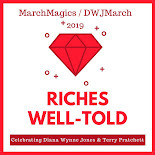 This book is well-written but as in all period detective fiction, a little bit of it is lost to a modern reader due to the use of jargon and current affairs references. Still, this is worth reading if you have any interest in 90 year old detective fiction or in The Maltese Falcon film. Now I need to decide if I want to read Hammett's The Thin Man series -- another set of movies that we watch quite often. Buy The Maltese Falcon on Amazon or find it at your local library.